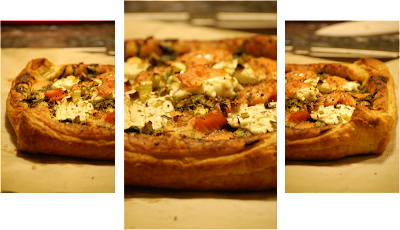 The Cooking Blog of Emilie French Chef: Spinach, Goat Cheese and smoked Salmon Feuillete ... a best off !! Spinach, Goat Cheese and smoked Salmon Feuillete ... a best off !! Who doesn't like the association Goat Cheese & fresh Spinach & Salmon ?? This tempting meal is a really easy to do ! The flavors were really balanced, and this meal is no greasy, salty, or bland ... it is just a perfect marriage with delicate flavors ! Enjoy the Feuillete warm, right out of the oven and with a glass of your favorite white Wine !! I highly recommend a Spring Mix Salad on the side to bring a fresh and crunchy touch to your Feuillete !! Roll out the sheet of puff pastry on a sheet of Parchment paper. In a pan, add both onions with 1 tbspoon of Olive Oil and cook on medium until you get a caramelized color. (Add the Zucchinis slices if you use some. Stir in the onions). Add the Spinaches and add 1/3 cup of water. Cover the pan and cook on low heat until Spinaches are tender and water is evaporated. Add Salt and Pepper (dont use to much Salt, Salmon is already salty). Add the smoked Salmon previously sliced into strips - and stir in the Spinach. Add 3 tablespoons (or 2 large spoons) of sour Cream. Stir for 2 minutes over low heat. Remove from heat. The mixture should be compact (if not, keep heating). Spread the mixture in the middle of the puff pastry (look at the picture above). Add pieces of Goat Cheese on top of the mixture and add Pepper. Close the edges of the dough on the mixture (look at the picture above). Bake 20 minutes in the oven or until the crust is puffy, and has a nice brown color. Serve with a Salad on the side. Not sure if you are aware of it, but Pepperidge Farm Puff Pastry has hydrogenated fats in it. Trader Joe's sells a great all-butter puff pastry for a reasonable price, but unfortunately it's only a seasonal item. I have been stocking my freezer with many packages in the last few weeks. Parmesan & Pesto Twists ... bring the wine ! !